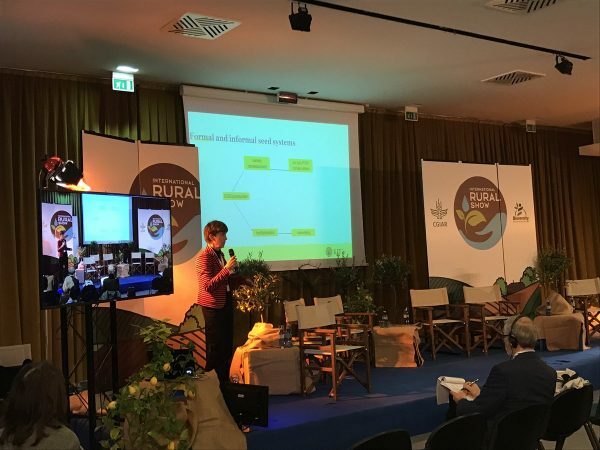 The Access to Seeds Index was presented at the first International Forum on Nourishing People and Sustaining the Planet, that took place on Rome, Italy on 23 February 2018. The Forum gathered experts from the Food and Agriculture Organization of the United Nations (FAO), the Italian Ministries of Environment, Agriculture, Foreign Affairs and Agribusinesses, investors and the media in an interactive discussion with an invited audience on the benefits, opportunities and ways of using diversity – from production to consumption – for healthy diets and sustainable food and agriculture systems. Ms. Coosje Hoogendoorn explained that the second Access to Seeds Index, to be published in 2019, will place more emphasis on agrobiodiversity and the role seed companies can play to support this.